Before blogging, YouTube and Pinterest I was a total makeup noob. Ok, I still am one, but not quite as bad thanks to the internet, which contains a wealth of fantastic makeup tips and tricks. I use so many of them on a regular, if not daily, basis and these are 10 of my favourites. 1. Apply foundation downwards. As the hairs on our skin sit downwards, foundation will look more natural than if applied in any other direction. 2. Apply concealer under the eyes in a upside down triangle shape, around and down past your dark circles - as opposed to applying directly and only on dark circles. The concealer will look more seamless and less obvious this way. 3. Use the two finger trick to know where to start applying blusher. Simply place two fingers together next to your nose and apply blusher from the other side. 4. To give blusher a more natural finish, lightly buff the edges with the brush you used for your last base product i.e. powder or foundation. This will soften the edges with any left over product so the blusher colour will look more like it's glowing from within than sat on top of the cheeks. 5. When setting your base with powder and a brush, pat it on with light, bouncy motions rather than sweeping it across the skin, as you're less likely to disturb the makeup you've already applied. 6. If you've just run out of your light to medium coverage foundation or tend to only buy high coverage foundation, you can sheer the high coverage foundation out by using a damp makeup sponge. The water on the sponge will slightly dilute the foundation. 7. Don't own an eyeshadow primer? No problem, try using a cream eyeshadow in a similar or neutral shade as your primer instead. Cream eyeshadows are very long wearing and it will still give the eyeshadow going on top something to adhere to. 8. This one is a bit fiddly, but great if you're not quite sure where your cheekbones are to apply highlighter. Turn your hand over so your palm is facing up and place the bottom of your palm onto your cheeks. The bottom of your palm will sit comfortably and naturally on your cheekbone when in the right place! 9. Take advantage of multi-tasking makeup when applying in a rush or travelling - for example, cream blusher can be also be applied as a lip product to add a wash of colour with a subtle sheen. 10. If you want to set your brows in place but don't have a brow wax or gel to hand, use some hairspray instead and run through brows with a spoil or old mascara wand (though not too much hairspray - crispy brows aren't a good look). What are your favourite tips for applying makeup? I'd love to learn some more. I am thinking of doing more makeup tips posts in the future, so please leave your tips in the comments box and I may well include them in another post with a credit! 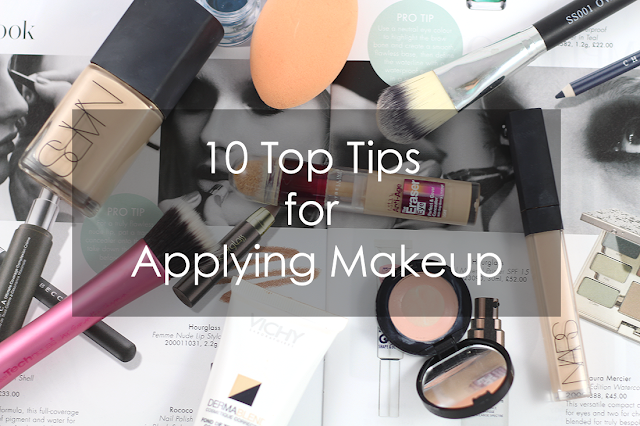 I loved reading those tips, especially two fingers rule for applying blusher - thank you! Great post! Great tips! Before blogging I was so bad with makeup. I mean I am still learning, but at least now I know the importance of brushes and bronzers:)) The tips for applying blusher are so handy! I love the two finger trick! I might just be able to start wearing blusher now! Please do more posts like this! Definitely going to take in consideration all of these tips. I'm completely clueless about makeup haha! These are amazing! Definitely gonna put my foundation on downwards now and use hairspray in my eyebrows as I always struggle trying to keep my eyebrows in place! Great tips. Totally trying them out!